This was perhaps the best potential weekend slate of games in ACC play this season and it didn’t disappoint in terms of excitement. In the national headliner, Duke completed a regular season sweep of Virginia by besting the Cavaliers, 81-71, in Charlottesville on Saturday evening. In a surprisingly close call, North Carolina remained tied with the Blue Devils atop the league standings with a comeback overtime win over Miami in the Smith Center. In other key contests, a pair of ranked ACC squads fell on the road — Clemson handled Virginia Tech, 59-51, in Littlejohn Coliseum; and Florida State rallied to take Louisville into overtime in Tallahassee, winning by a score of 80-75. Here are the highlights from the weekend around the ACC. Best Win: Duke once again showed it can solve Virginia’s pack-line defense, mostly because of an unanticipated Blue Devils’ explosion from behind the arc. Tony Bennett’s squad gave up 13 three-pointers — the most it had given up previous to this game was eight against Notre Dame — but great outside shooting wasn’t all that went well for Mike Krzyzewski’s club. Duke held a 17-0 edge in fast break points as well as a 14-9 advantage in second-chance points, despite the fact that Virginia grabbed six more offensive boards than the Blue Devils. RJ Barrett led the way with 26 points, giving him a total of 56 in two games versus the Cavaliers. This contest marked the beginning of an extremely tough stretch of games for Duke — its next five games are all against top 45 teams, three of which are on the road. Meanwhile, Virginia has a quick turnaround, traveling to face ACC co-leader North Carolina tonight. Second Best Win: With no real bad losses over the weekend, we opt to highlight another big ACC win. Florida State won its fifth ACC game in a row with a gutty comeback win over Louisville, a game in which the Seminoles trailed by double-figures midway through the second half. Leonard Hamilton’s guys were outshot from the field by a wide margin (48.1 percent to 37.7 percent), so how did they pull it off? Two ways — by posting a huge edge in turnover margin (+15) and dominating the free throw game — Florida State went 27-of-36 at the stripe while Louisville was 13-of-16. The Seminoles have definitely righted the ship after their 1-4 start in conference play, and are now in contention for a top-four finish in the league, which comes with the cherished double-bye in the ACC Tournament. 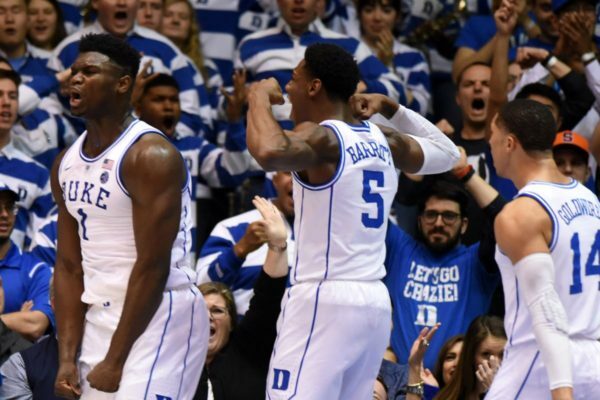 The first ACC clash of the titans lived up to the hype as Duke edged Virginia, 72-70, in an electric Cameron Indoor Stadium on Saturday night. And luckily for us, those two league heavyweights will do it all over again in three weeks in Charlottesville, with one or even two more meetings possible in the postseason. Elsewhere in the league, two other Triangle schools picked up hard earned road wins. North Carolina used a late three-point shooting barrage to pull away from a pesky Miami team, 85-76, and NC State (still playing without point guard Markell Johnson) held off Notre Dame, 77-73. Here are the highlights from the weekend around the ACC. 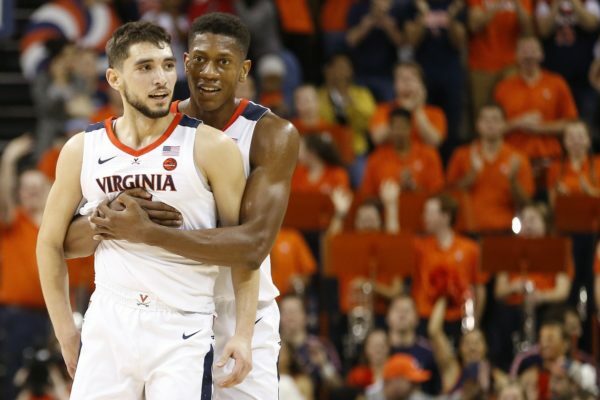 Best Win: Ever since Tony Bennett raised Virginia to elite status in the ACC hierarchy beginning in the 2013-14 season, the Cavaliers’ games in Durham have been instant classics. To say this game between co-#1 teams could have gone either way would be a vast understatement – for an eight-minute stretch in the middle of the second half, neither school held more than a one-point lead. While the rest of the ACC has struggled to score against Virginia’s pack-line defense, Duke seems to have cracked the code. Only nine league opponents have scored over 1.12 points per possession against Virginia over the last six seasons, but Duke has managed to do it four times, including a 1.14 mark on Saturday. Of course, it may be more a matter of talent than strategy. 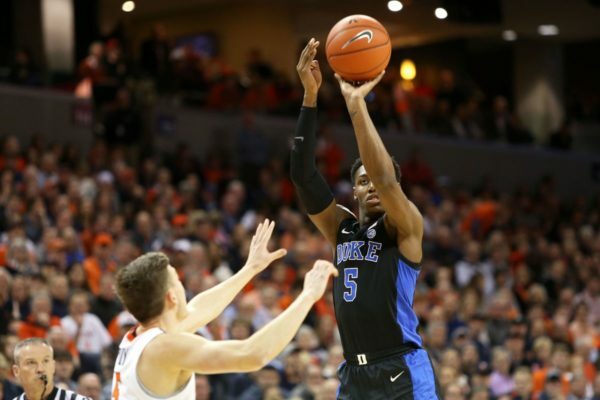 Mike Krzyzewski has had numerous elite players to call on lately, including, most recently, the transcendental talents of Zion Williamson and RJ Barrett. Playing without injured point guard Tre Jones, the Blue Devils relied on Barrett (30 points) and Williamson (27 points) to become the first pair of opponents to score more than 25 points against the Cavaliers in the Bennett era. Both teams were effective in the paint but less so from distance – Duke went 2-of-14 from deep while Virginia connected on only three of its 17 three-point tries. That’s where Virginia must feel it let a huge road win get away. While Duke has been struggling with the three-pointer all year, the Cavaliers have been one of the nation’s best outside shooting teams. Expect another classic when the two face off again in three weeks. Worst Loss: Call it the Duke Hangover, Part 2. Last Saturday, Florida State was one second away from stunning the top-ranked Blue Devils, but now, Leonard Hamilton‘s team is looking at a three-game losing streak after back-to-back road upsets at Pittsburgh and Boston College. The Seminoles blew a 10-point halftime lead Sunday afternoon in Conte Forum en route to an 87-82 loss to the Eagles. As has become the custom, Florida State was killed from behind the arc – the Seminoles went 8-of-25 from deep while allowing Boston College to make 13-of-21 from long distance. In five ACC games to date, Florida State ranks last in the league in three-point shooting (24.8%) and is tied for worst in opponents’ success from deep (41.7%). Let the Ty Jerome hype begin. Kyle Guy is the All-American and De’Andre Hunter gets the NBA love, but Ty Jerome is still the engine for this Virginia team. On Tuesday night, Jerome notched 20 points in the Cavaliers’ win over Towson, making six of his nine shots from three-point range. His 70.9 Defensive Rating will obviously trend toward normal as the competition improves, but his size allows him to bother smaller guards and is the key to Tony Bennett’s defense. Florida State’s shooting. While Leonard Hamilton’s team defense was impressive in the Seminole’s blowout win over Florida, it was their shooting against the Gators that was even more intriguing. A team that shot just 35 percent from long distance a year ago and lost its top two shooters (CJ Walker and Braian Angola-Rodas) probably shouldn’t be expected to make 11-of-23 three-pointers against another high-major team, but Florida State did just that. It appeared as if Hamilton’s team might be lacking a knock-down outside shooter this season, but if PJ Savoy (5-of-7 3FG) can fill that role, the Seminoles could become something special. Jeff Capel’s freshmen. Yes, it was only one game against Youngstown State, but it’s clear that this is a new era at Pittsburgh. Three freshmen guards started for Jeff Capel’s team on Tuesday night, and it is already obvious that they are the future of the Panthers’ program. Point guard Xavier Johnson scored 16 points and added six assists and five rebounds; Trey McGowens poured in 17 points and shot 6-of-11 from the field; Au’Diese Toney added 12 points and nine rebounds. The Panthers will still struggle in the ACC this year, but their rookie trio will at least give Pittsburgh fans a reason to tune in each night.